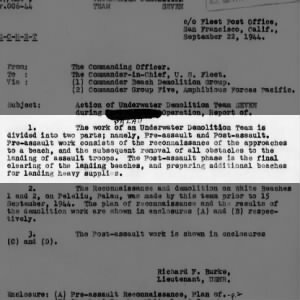 Before there were the Navy SEALs, there were the Underwater Demolition Teams (UDTs) of World War II in the Pacific. UDTs were in charge of reconnaissance of the shoreline prior to an amphibious invasion. They would reconnoiter the lay of the beaches and offshore waters and be on the lookout for any natural or manmade obstructions that would hinder landing craft. They would then use explosives to demolish any obstacles. Although the UDTs were preceded by the Navy Scouts and Raiders and the Naval Combat Demolition Units (NCDUs) in the European Theater, the need for a Pacific equivalent became obvious during the invasion at Tarawa in November 1943, when Marines became stranded on reefs that aerial reconnaissance had misjudged to be deep enough for landing craft. The Marines were forced to wade a thousand yards to shore, and some drowned and others were killed by enemy fire. This established the necessity of human surveillance of the shore waters before an invasion. 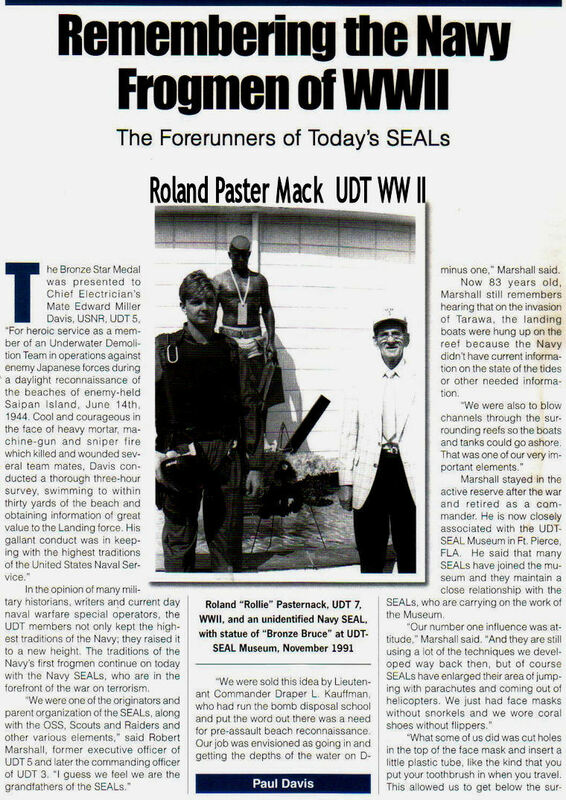 In the early days of the UDTs, members worked in the water in full fatigues and shoes, but real-world battle conditions showed the need for a greater emphasis on swimming, and UDT members began to wear swim trunks and fins, becoming the Navy’s elite combat swimmers. The 34 teams were involved in amphibious invasions across the Pacific, including in Saipan, Tinian, the Philippines, Iwo Jima, Guam, and Okinawa—just to name a few. Do you have any family members who served on an Underwater Demolition Team? Tell us about them! Or search for more info on UDTs on Fold3. John A. Mundell, Jr., a prominent admiralty attorney and Captain, USNR-Ret., died May 1, 2011, in Royal Oak. He was 87 years old. John was born on Father�s Day, June 20, 1923, in Chicago, Illinois to the late Matilda Ellen Paterson Mundell and the late Reverend Dr. John A. Mundell, Sr., Pastor of Fort Street Presbyterian Church in Detroit. He graduated from Royal Oak Dondero High School in 1941, and attended Alma College from 1941-1942, where he was inducted into the Athletic Hall of Fame for track and field. John was a 1946 graduate of Oberlin College where he was an NCAA All-American in track and field. During WWII he served in the United States Marine Corps as a decorated member of Underwater Demolition Team (UDT) #21, and Navy Frogman, predecessor to the Navy S.E.A.L. program which participated in several landings in the Pacific. John was among the first Naval personnel to go ashore in Japan in 1945, clearing the beaches where others would follow. For his efforts, he was awarded the Bronze Star. From 1946-1947, John served with the U.S. Diplomatic Courier Service, U.S. State Department traveling throughout the world delivering top secret documents. He received his Juris Doctorate and Masters of Law as a 1949 graduate of the University of Detroit Law School. John was recalled to active duty for the Korean War and served in the Office of Naval Intelligence, Washington DC. Upon being released from active duty in 1953, Captain Mundell served as Officer-in-Charge Naval Intelligence Unit 9-1-2 in Detroit for three years and for two years was the Commanding Officer, Naval Reserve Intelligence Division, Great Lakes. John remained with the U.S. Naval Reserve until 1983. His wartime experience was recently recorded for the Library of Congress by Senator Sander Levin. John joined the Detroit based law firm of Foster Meadows and Ballard in 1953 as an associate, later partner and President as an Admiralty and Maritime law specialist. He was an adjunct professor of law at the University of Detroit in Admiralty and Maritime Law. Some of his career highlights include arguing a case on behalf of Ford Motor Company in front of Chief Justice Berger for the Supreme Court of the United States in Vella v the For d Motor Company and numerous cases in front of the U.S. Federal Appellate Court; former outside Counsel Ford Motor Company, Boblo Island Boat Company, State of Michigan; Special Assistant to Attorney General Kelly � State of Michigan; and was instrumental in bringing Japanese car company, Isuzu to the United States. He retired to private practice in 1983. As a long time member of the Kirk in the Hills, John served as an ordained Elder, Trustee, and founder of the Acolyte program. He was also past president and founding member of Stonycroft Hills Club in Bloomfield Hills. John is survived by his wife of 56 years, Evelyn Colleen Robson Mundell, son, John A Mundell III, and four grandchildren, Caroline Ellen Mundell, Katherine �Lily� Elizabeth Mundell, John �Jack� A. Mundell IV, and Ellen Grace Mundell. He is also survived by numerous nieces and nephews. John was a beloved father, son, brother, grandfather, friend, and mentor to many people. A Memorial Service will be held at Kirk in the Hills, 1340 W. Long Lake Road, Bloomfield Hills, Saturday, May 21st at 1pm. There will be a private family ceremony at a future date, in his final resting place � Arlington National Cemetery, Arlington, Virginia. Memorials appreciated to Kirk in the Hills or UDT-Seal Museum, 3300 North Highway, Suite A1a, Fort Pierce, Florida. and respectfully, I didn’t see an obituary for Captain John A. Mundell. My father, Wesley Arthur Smith was in UDT Team 22 stationed out of Norfolk, VA.
Another partial obituary for a UDT member. John Brooks was born on August 17, 1922 near Green, Kansas, the son of John Sr. and Daisy (Carswell) Brooks. John attended Pleasant Hill School near Green. He entered the United States Navy on October 29, 1942. During the Normandy invasion, John was in combat at Omaha Beach and served on an underwater demolition team and was an expert deep sea diver. While serving in WWII on the USS Henrico, he saw combat in both the Atlantic and Pacific Theaters. The ship was eventually struck by an enemy kamikaze plane, after which, he was transferred to the USS Goodhue. After serving three and a half years, he was honorably discharged as a Motor Machinist’s Mate 2nd Class. After returning to Manhattan, he worked for the Soil Conservation Service. As a former UDT/SEAL I’d like to suggest contacting our community leaders to afford our Teammate a proper obituary. I’m sure he had comrades-in-arms who would appreciate the knowlede of his passing. Motor Machinist Mate was, were they another rate, or were they the same as the MM’s that I served with? My uncle, Franklin Isaac SEAL, served during WWll in unit UDT 25. He was a Gunners Mate 2C while in the US Navy and also served during the Korean War. My uncle George W Bird was a frogman in WWII. My cousin Doyle Merkel was UDT member and operated in coastal waters during the Korean conflict. My uncle, Glenn Alex Taylor, was on a UDT team during WWII. He lost his hearing temporarily once because he was underwater when an explosion occurred. He was from Virginia. If anyone has information about him during his service, please contact me. He didn’t talk about it to us. My dad is still alive. I will see if he knew your uncle. My father was in Team 9, awarded Silver Star for action at Leyte Gulf. He has since passed away in 2010, was a great man, and we miss him still. His name was Hiram B. Dickson. If anyone has any information, stories, would love to hear them. We did not know the full story of his job and what happened to his team until later in life as it was very difficult for him to speak of it. He lost men both at the beach and during subsequent kamikaze attack. Very interesting. My grandfather was Team 9 in WWII and never spoke of it. I visited the UDT/Seal Museum in Ft. Pierce and was able to have a copy of some of the letters folks wrote. What was your grandfather’s name? My dad, once he was in his eighties, finally told me what happened to his team; fighting in the water, kamikaze attacks. He spoke of at least two friends he lost there. I’ve been to Ft Pierce as well. Very poignant. They all were very brave young men, far from home. My father, Robert H. Dabney, was a frogman with the Unites States Marines 5th Division in WWII. He was one of those who cleared the way for the landing on Iwo Jima. He finished his reconnaissance then jumped quickly into a transport and marched up Mount Suribachi. He was halfway up the hill when the famous photo of the marines raising the U.S. flag was taken. He was also on some of the other islands, including Guadacanal. He received the Bronze Star medal. ‘Around the World in 93 Years, An Uncharted Journey’ by Sue Dabney Catalano gives some insights into being the wife of such an adventurous Marine in WWII. Deborah, I wonder if your dad and my football coach were in the same unit, though I believe Coach Willie Long was in a naval unit? My father-in-law, Walter T. White, served in the UDTs in 1943-45. He was injured one time of all the missions they worked. Was honorably discharged after the war ended. My cousin John Busich US Navy, served as a frog man during WW II. Like a lot of veterans he never told much about what he did. He did tell me once that some of his missions were deployed from submarines. SAN PABLO – In the 1986 movie “Back to School,” the middle-aged Rodney Dangerfield goes to college and joins the varsity diving team. He might have taken his inspiration from the real-life St. John Smith, scholar, sportsman, war hero, Gentleman. Smith, a former football coach and teacher, came out of retirement in 1979 at age 60 to enroll at Contra Costa College and ended up on the golf team. “Saint was quite an athlete, and when he retired, his love became golf,” said Tom Kinnard, the athletic director at Contra Costa College and former El Cerrito High School quarterback during Smith’s coaching days in the 1950s. In his college days the first time around Smith had been on track-and-field and football teams at Louisiana State University and Tulane University, remembered Neill Gunn, Smith’s friend, golf buddy and fellow football coach in the West County school district. Smith was tailback on the 1938 Tulane team that went undefeated during the regular season, said Gunn, the football coach at Richmond High School in the 1950s who competed against Smith’s team for nine years. “He was a triple threat: ran the ball, passed the ball, kicked the ball,” said Gunn. Smith also ran track and pole-vaulted, Gunn remembered. But Smith had never lettered in golf. He didn’t take up the game until middle age. According to new National Collegiate Athletic Association rules set in the 1970s, he was eligible to play any college sport at Contra Costa College that he hadn’t played before. To do it, he had to be a full-time student. So he signed up for 12 credits in computer study. “He wanted to learn the computer anyway,” said Gunn, who in 1975 had moved to Contra Costa College, where he ended up as Smith’s golf coach. Smith died Nov. 24. He was 79 and had lived in San Pablo for 42 years. Breakout, Epitaph; Edition: Final; Page: A37. Copyright (c) 1998 Contra Costa Times. Yep. My dad, Helmuth Tupot, was UDT, 1955-1959, on USS Capricornus and USS Tanner, assigned as electrician’s mate. He turned 17 the month he volunteered. He was assigned Transphibron 6. His group landed the Marines in Lebanon. He went on to work on Apollo 13 at Grumman. He was one of the team that wired its lunar module. Now, we volunteer him to teach kids to solder at Maker Faire at the New York Hall of Science. 😉 And, yes, it takes a lot to get him to talk about his time, and is very uncomfortable about all the hero talk today. They saw themselves as a collective group. In 1956, I was trained by former UDT personnel as part of preparation for the Explosive Ordnance School, then in Indian Head Maryland. I served one year at Skiffes Creek Annex to the Naval Mind Depot, Yorktown VA, during which I and my EOD Team “rendered safe” a dud-fired Civil War round. (Tried to remove fuze, but had to use a shaped charge on its side: the black powder inside blew high order in a big cloud). I served twice on Kwajalein, Marshall Islands, through 1959. There we cleared many US and Jap ordnance left from the battles there in 1944. We heard that the Army had underwater swimmers there to survey lagoon-side beaches. My husband Fred Allen Loutzenhiser was in UDT. He joined the Navy when he was 17 years old. He was present at the Bikini A Bomb test. He was in China for 4 years assigned to the USS Dixie. After WWII he was based in the Phillipines and they were defusing the bombs in Manilla Bay. He was a Froggie in Korea for a short time. Hi Merrilyn, do you have any relatives out here in Southern California? Many Scout and Raider personnel returning from Europe were given special assignment with the U.S. Naval Group in China, headed by Captain (later Admiral) Milton “Mary” Miles. He and his Chinese counterpart set up the Sino-American Cooperative Organization (SACO) to train, equip, and direct guerrilla forces against the Japanese occupation of China. To help bolster the work of SACO, the Chief of Naval Operations Admiral Ernest J. King ordered 120 officers and 900 men trained for ”Amphibious Roger” at the Scout and Raider School at Ft. Pierce. My father, John, (Jack) F. Gavegan was part of our “Rice Paddy Navy”. He was stationed in mainland China observing the Japanese ships and also monitoring the weather which he radioed to our navel ships. I wish I knew more of this group. This is my uncle who served with UDT 7. My father, Clayton Lee Mann, was also in UDT 7. He died in 1965. My father, Russell R. Turner, taught Underwater Demolition in WWII. He was stationed at Ft. Pierce FL. I have pictures of he and his friends in uniform in front of a tent. I have furniture made from the mahogany that they were going to burn after the war. One man built his house out of it. My father, Charles D Miller, also taught in Ft. Pierce. I was born there on the last day of the war; when the treaty was signed. His picture is in the UDT/Seal museum in the display for WW2. He is holding a Miami Herald newspaper that says the war is over. I too had the naval training as a frogman in the Swedish Navy 1960-61. Tough but educating and most of all, the good comradeship when you are in the hands by your diving comrades. Also,a good cofirmation about your physical and mental Health plus a physical condition you never experienced Before. There was a newspaper article. Don’t have all the details. I seem to remember reading the ship was hit and the “team” was lost. My dad had the singular pleasure of graduating UDTR training TWICE – once with class 04, and again with class 16. The second time, some of his instructors had been his trainees. My uncle BURL Q. BARKER was one. We called them frogmen because of the fins they wore. First there were Seabees, trained in construction and in demolition…. Who best to become the first Underwater Demolition Team members? The Seabees did a lot during and after WWII, and rarely do I see them credited… The Marines moved in on “Roads the Seabees Built” and through lagoons the Seabees cleared… Aviators landed on runways Seabees cleared and laid. All slept in Quanset Hut cities Seabees built….. I’d like to see more research in this area of unsung heros…. I couldn’t agree with you anymore! Captain Wilfred L. Painter (CEC, USNR), was truly a legend in Seabee history. A movie could be made of his exploits. Much of his work in the Pacific had been confidential, almost nothing was written about him. Author William Bradford Huie, in his book From “Omaha to Okinawa” wrote a few pages about him. I have condensed some of Huie’s writing. If Painter had lived in the 16th Century, he would have been Captain Blood, if in the 19th, he would have been a mixture of Jeb Stuart, Buffalo Bill, and Jesse James. After Guadalcanal, Painter became one of the Navy’s advance Scouts in the Pacific. It was his job to pick landing sites, and particularly to pick the sites for airfields to support our operations. On every island in the Solomons on which we landed, Painter was there before the landing – surveying, taking soundings, determining whether and how fast an airfield could be built there. He had sneaked ashore from Submarines and PT boats, hidden in caves, dodged Japs, ambushed Japs, made rendezvous with his subs and PT’s, and returned with the information on which the decisions were made. Painter is an engineer. To understand the importance of his work, you must understand the importance of his work, you must understand the importance of engineering to the war’s naval operations. Every landing we made in the Pacific was made with one prinipal aim in view: to obtain an airfield. If the Japanese had an airfield on the island, was it on the best site? could the Jpanese field be lengthened and enlarged for our use? If not, where was such a site? What about prevailing wind direction and its relation to proposed runways? Was there a coral deposit nearby? If not, what would be used for building material on the runways? What about supplying the airfield? Was there deep water nearby in which piers could be built and Liberty ships docked? Some of our line admirals were slow in realizing their dependence on those engineering considerations, but Painter, with his brusque but efficient manner, was there to advise them. Admiral Halsey, no shrinking violet himself, quickly recognized Painters value, and Painter became a captain at thirty-five the youngest four striper in the Navy. On Pearl Harbor Day he was building a dry dock at Long Beach. He was rushed to Pearl Harbor and placed in charge of raising the battleships California and West Virginia. He worked like a fiend. He dived with divers, and was so covered with scum each night that he had to bathe in Kerosene. A doctor was assigned to follow him throughout the dark, muddy bowels of the big ships to revive him when he collapsed from sulphur dioxide gas. He had both ships raised and in dry dock before anybody believed it was possible. The earliest Seabees had been rushed to Efate and Espiritu Santo, and they completed an emergency airstrip at Santo – our first jump off base – just ten days before D-Day at Guadalcanal. Painter was in this area as engineering officer on the staff of Vice Admiral McCain, commander of naval aircraft in the South Pacific. In effect, he became all around engineering handy man for Admirals McCain, Turner, and Halsey throughout the South Pacific campaign, In effect, many of the engineering decisions, were Painters, as evidenced by the fact that he was jumped from Lieutenent, to Lieutenent Commander, to Commander, and then to Captain in rapid order. He was thirty five when he put on his four stripes. Rank meant nothing to Painter, however. Like most of the Seabee officers, he was essentially a civilian, and wanted only to get the job done and get out. He hates red tape, and his adventures in cutting it are Pacific legends. He would tell off an Admiral as quickly as he would a seaman second-class, and only his sheer ability as recognized by broad-guaged men like Admirals Moreell, Halsey, and Nimitz kept him from being canned. Painter tore around the South Pacific on all sorts of missions. Two days after the Marines had taken Henderson Field, he landed there in Admiral McCain’s flag plane and began surveying sites for fighter strips Nos. 1&2. The Japs came over, Painters plane had to run off and he was left on Guadalcanal. When the old destroyer Mcfarland was hit, Painter patched her up and saved her. When we were ready to move northward “up the slot” Painter was sent to New Georgia to pick the landing and airfield sites. He sneaked ashore there and found a British colonial official who was hiding from the Japs with a small party of natives. The Britisher provided Painter with a canoe, a guide, and some bearers, and the party started on the water trip across Viro Harbor, which was held by the Japanese. A storm almost swamped the canoe before it could reach shore. Painter spent the night in a cave. Next day, as the wind became even stronger, he abandoned the canoe and set out to explore all the land around Viro Harbor by foot. With his native guides, he waded swamp for two days, traversed thirty miles, and concluded that a landing was not feasible at Viro. There was no site where an airfield could be built quickly. Painter left the Viro area, went to Segi Point, and found the spot he was looking for. Disguised as a native and in a captured Japanese landing craft, Painter took soundings off Segi in full view of Japanese land parties. Later Painter returned to Segi with a survey party and actually began work on the airstrip. The 47th Seabee Battalion landed there on June 30, 1943, D-Day in the Munda operation – and completed the airfield in ten days. This was only the beginning of Painters scouting experiences. He dressed like Davey Crockett. He flew thousands of miles, traveled in PT’s and subs. He was fired on by Japs and Americans alike. He was on Northern Luzon looking for airfield sites long before the Japanese realized that they had last the Philippines. He has been other places, too, but the full story will have to wait. WHEN THREE CIVIL ENGINEER CORPS OFFICERS WERE NEEDED TO JOIN A MARINE RECONNAISSANCE PATROL ON A DANGEROUS VISIT TO A Japanese HELD ISLAND IN THE SOUTH PACIFIC, VOLUNTEERS INCLUDED LT. WILLIAM T. MALEY, CEC, USN. LT., CLEVELAND R. HORNE, JR., CEC, USN, AND LT. (JG) JOHN H. HARKER, CEC, USNR ALL OF WHOM WERE ATTACHED TO SEABEE BATTALIONS STATIONED AT ADVANCED BASES IN THE AREA. FOR THEIR ACHIEVEMENTS WHILE ON THIS MISSION, LT. MALEY AND LT. HARKER HAVE BEEN AWARDED THE SILVER STAR MEDAL. LT HORNE HAS RECEIVED A CITATION FROM ADMIRAL HALSEY. THE PARTY’S HAZARDOUS ASSIGNMENT WAS TO OBTAIN INFORMATION CONCERNING TERRAIN, HYDROGRAPHIC CONDITIONS AND HOSTILE DISPOSITIONS ON THE ENEMY HELD ISLAND. IT’S MEMBERS KNEW THEY WERE ENTIRELY ON THEIR OWN, THEY COULD EXPECT NO OUTSIDE ASSISTANCE FROM ALLIED FORCES. THE DATA THEY GATHERED IS EXPECTED TO BE OF CONSIDERABLE VALUE IN THE CONDUCT OF FUTURE OPERATIONS. I agree. I served as a DK3rd class with MCB5 during the late 50’s and early 60’s. I find all of this very interesting. We were out of Port Hueneme, California. We did work on Guam and on Okinawa when I was attached. There was a movie made about the Seabees with John Wayne and it took place during WWII. My partner’s father was a UDT. His name was Robert Throckmorten Mullen. He was from Pittsburgh PA. He was in the OSI. If he,was with OSI, he was probably in UDT 10. That unit was an experiment of sorts, combining OSI agents, some Marines, along with Navy personnel. My late husband, William Patrick Ryan, enlisted Chicago, was in team 8. Served in the Pacific. Any info would be appreciated. Does any of the Marines’ families remember a Tony Forte, US Marines? One of the sites where he participate in WWII was Iwo Jima. My father, Clayton Lee Mann, was in the Pacific with UDT Team 7. He lied about his age and joined up at 16. He also served in Occupied Japan after the end of WWII. i believe the actor willian hopper of the perry mason series was also a udt in ww2. My dad, Charles Blanton, was a frogman dying the latter part of WWII. Like so many WWII veterans Dad spoke very little about his service. He taught me to dive when I was a boy. He was one of the best men thst I have ever known. My father was on UDT 20 and is living in an assisted living facility near us. He is a cool guy, sharp-witted, loves to joke with people. And still tells us of some of his experiences in the South Pacific. It’s what he mainly talks about these days. He’s still pretty sharp, although dementia is starting to set in. My cousin, JAMES BRADY, was a frog man in WWII. He was a decorated war hero who swam underwater to cut cables holding bombs that would potentially sink our ships if they would hit them. He was the son Francis Bohn and step son of Alvin Bohn. As a yong boy James became an expert horseman, learning his skills from my father HEBER ROSE, one of the great horsemen of all time! James answered the call to arms to serve his country and joined the US Navy! He was a TRUE PATRIOT who, with valor, fought with every ounce of strength, courage and commitment to defend his country and serve his fellow man! JAMES BRADY- my cousin – my hero and my friend! My husband, Russell Irby, served in UDT-12 during the Vietnam War. He was in BUDS Class 57 at NAB Coronado, CA. Sadly, he passed away on July 2, 2016, after a hard fought battle with cancer. I, much like others really want to see much more about the “Unsung Heroes” the Sea Bees. Can fold3 get it done?! My brother, Gerald E. Krause, was a UDT in Korea. The only thing he mentioned was getting his ear drums broken by an underwater blast. My father was frogman, Lt.jg Paul Gerald Meredith of Team 10. He kept a diary of his training and deployment. He told me of the hiding place on his death bed. Fascinating reading of topics he never discussed of his WWII experiences. Paul Meredith then trained frogman at Coronado, San Diego, CA, for the Korean War. While at Coronado he also coached boxing and football for the Navy. My college professor Daniel Turner, a coastal geologist, was one of two naval officers who started what became the UDT. He was working in Washington when head of naval operation called him and another geologist into his office. He told them what happened at Tarrawa and then told them that would never happen again and it was their responsibility. Dr. (Comander) Turner was at all the invasions. He told us that the UDT started when they split his team so half could remove beach obstacles while his team mapped the coast and beaches. His last assignment was to reset channel markers on the Yellow River in China after the war. Jima beach clearing. He was later awarded a SilverStar for this action. My father, Arthur Patton was a UDT member, I am not sure his unit. He received a Bronze Star for he actions just off shore of Iwo Jima. His buddy was hit and my Father swam back and brought him to the pick up spot. He was also a member of the American Defenders of Bataan and Corregidor. My father’s first cousin ARM2c Stan Whitby and his pilot Lt. jg Cliff Jordan while flying from the USS Essex on July 23rd 1944 were shot down off the island of Tinian after making a dive bombing attack against gun emplacements prior to the invasion by the Marines. Their SB2C-3 Helldiver from VB-15 made a successful water landing in the bay, but Lt. Jordan was wounded and unconscious after hitting his head on the gun site, Stan climbed out of the gunners well and up to the cockpit where he freed Lt. Jordan, pulled him out, inflated his Mae West and swam away from the sinking Helldiver pulling Lt. Jordan with him. There was a UDT team off the island that morning that saw the ditching and were able to come to their aid, who were these men? The After Action Report from VB-15 doesn’t gives these details. Unfortunately, Stan was killed three months later in the South China Sea when he was shot down again while flying with another pilot. My dad, RM3C Robert D. DeViney was a radioman on LCI-G 457 at Iwo Jima on Feb 17, 1945 providing cover fire for the Navy swimmers. The 457 was first in line of the initial 7 LCIs to head past Mt. Suribachi. All 7 of the LCIs were hit heavily, plus the 5 in reserve who then came in, but the mission was a success and almost all of the swimmers were safely recovered. The mission was the subject of the book Iwo Jima Recon. Dad passed away yesterday at 91 1/2 after a long career as a missionary to Japan, and then as a pastor in Washington State. I am son 3 of 4. My Dad, Loren C. Cook, was a UDT member in the Pacific. Silver Star and Purple Heart. He still had some of the gear and we, kids, played with it in the ’50s. My cousin was a UDT in the Marines during the Vietnam War. His name was Robert Grumbine . I know very little about his service other than he also served as a gunner on a helicopter which was shot down making him the lone survivor of the crash. If you find what UDT he belonged to , please email me. Before I retired I had the pleasure of meeting a Mr. Martin at a local diner. I learned from others that were more familiar with him that he was one of the very first “frogmen” in the U.S. Navy. I understand there is a picture or plaque in a Navy museum honoring him. The only thing he told me when I inquired about his service was that he spent his 19th birthday clearing the path for a landing at a south Pacific island that was to be attacked. Does anyone have more information on Mr. Martin? My Father in Law, Roy Ellis was in UDT 6 and finished u in UDT 13 at the end of WWII. He never talked about it, but did keep a diary and I am fortunate to have a copy of it. It was very interesting and helped me to understand why he never talked about some of his experiences.